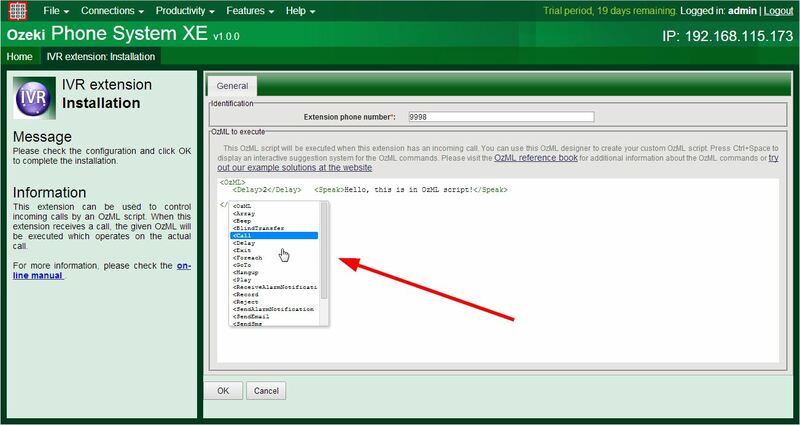 In this guide you can see how to make an Interactive Voice Response (IVR) in your Ozeki Phone System XE with the help of an IVR Extension using an OzML script. 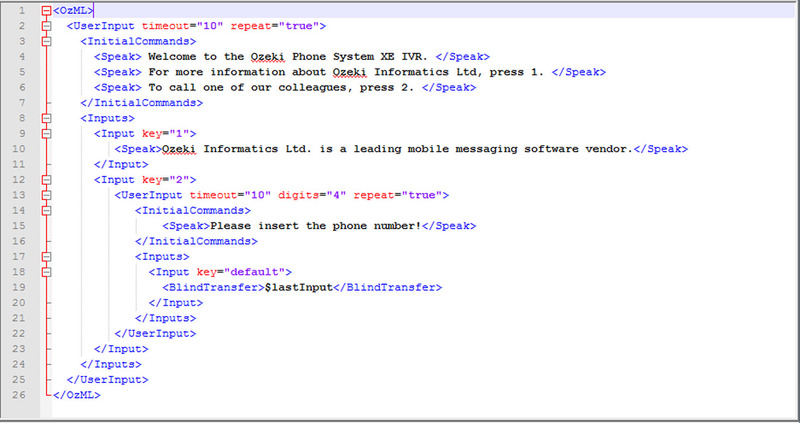 First you need to install a new IVR Extension on the graphical user interface of the Ozeki Phone System XE. Then insert an OzMLscript on the configuration form of the IVR Extension. IVR Extension is a standard extension that provides a phone number for execute preconfigured OzML commands. The OzML is an XML language which uses predefined commands. These commands are used in responses to the notifications coming from the phone system. For more information about these commands please visit the OzML referece book page. The phone number of the IVR Extension is used in the dial plan to forward calls to your extension. The IVR Extension can be used to control calls by an OzML script. When this extension receives a call, the configured OzML commands will be executed that operates on the actual call. On the Home screen click on the Add button that belongs to the Extensions (Figure 1). 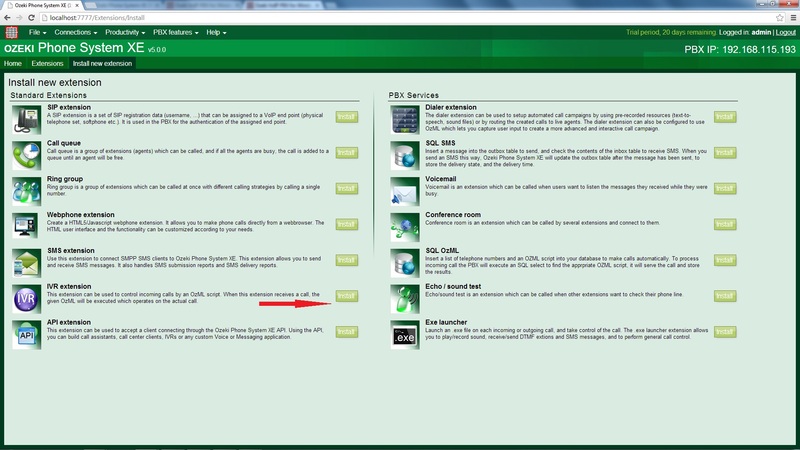 On the following website click on the Install button next to the IVR extension (Figure 2). After you have installed the IVR Extension, you will see the configuration from where you need to provide a phone number and insert the OzML script. The editor is highlight the OzML and also is capable of code completeing (by pressing the ctrl+space). In this Incoming call OzML example if you call your installed IVR extension with the phone number, you will hear a voice saying the following line: „Hello, this is in OzML script!” by using the Text-to-Speech function. But we can play pre-recorded .wav or .mp3 (local or downloaded from URL) sounds if we would like to. It is used when a client's call is transferred and the company plays music to the client till the phone is picked up by the support staff. We need to use the Play OzML command to use this function. An other important function of the IVR that we can add Userinput Commands. It is widely used to make IVR-s. You can add menu entries to it and give different commands to be executed by entering different menu entries. You can find the accurate description and the parameters of this command in the OzML reference book. 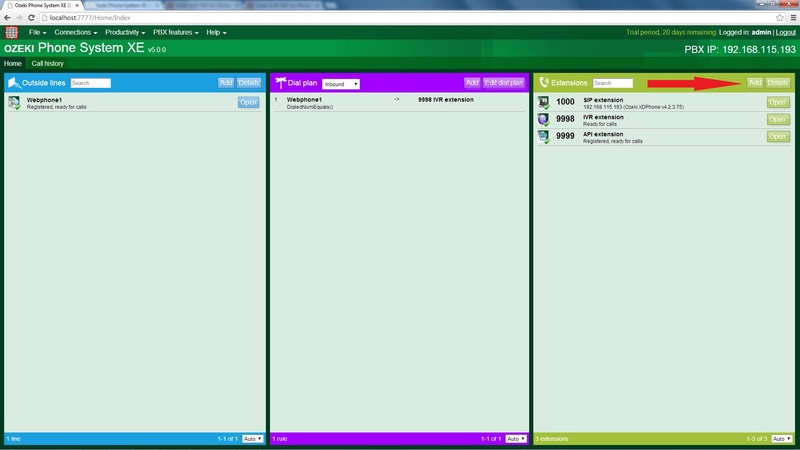 It is possible that we would like to build a hierarchical menu system. With the OzML we can do this easily, because our Userinputs can contain other Userinputs. The default value of the number of the digits that the IVR is waiting from the user is one. But if our input is a phone number or an ID, we need to add more digits than one. This is what the Digits command for. It's a specified number of digits to wait for the user to input. We can define the minimum and the maximum digit numbers that we need to add to the system with the MinDigits and the MaxDigits commands. In example 3. if we press the button 2 first, then we need to add a four digits phone number and the IVR will transfer us to this number with the Blind Transfer which gets the last input. We can reach the last input via the $lastInput variable. If the Input key is default then the whole block will be executed. If there was something problem with the OzML code, you can see a Warning line with warning code in the Log menu item. You can easily correct the problem in your IVR by using the informations of this line. After you have installed and configured the IVR Extension, you need to add a new Inbound routing rule to forward the incoming calls to this IVR. If your enterprise has just a few call agents or communitacion channels, and there is more incoming calls at the same time, with the Call queuing functionality of the Ozeki Phone System XE you can manage your customer's calls as efficiently as possible. You can play music on hold, play advertisement record, inform the customer when will he/she be connected and you can offer calling back if there are more customers waiting. 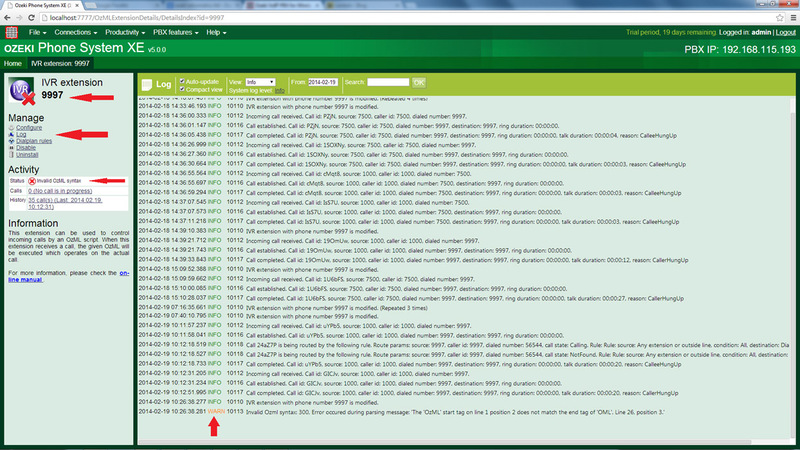 If you would like to read more details about this functionality please visit the guide on How to setup call queues.